Revenants, by Daniel Mills, is an interesting juxtaposition of literary kinds. It is, in one sense, a break with traditional New England realism and predictable narratives—narratives that seem to sequentially walk the reader through characters’ madness, hypocrisy, witchcraft, and other traditional themes where the plot and motifs are almost palpable. Mr. Mills’s novel, however, is organized around particular character threads that he arranges in the first part of the novel to later weave into a larger surrealist story. Revenants makes liberal use of character prolepses—where the plot is completely devoid of temporal end points. The themes, the characters, and the complexity of life are just as applicable to his readers as it is evidenced within the pages of his novel. In his somewhat cliché-ridden village in Massachusetts Bay Colony, the generations of his characters reiterate and act out familiar tropes of love, betrayal, guilt, penance, and absolution. The tough and stark environment—the Cold Marsh and the town’s name—is met with a complex setting of characters trying to make sense of “the unexplained” that surounds their village. When girls in the town go missing, the town is left trying to cope with and explain the phenomenon. The doctrinally-laden Cold Marsh wants to make sense of whether these disappears mark character flaws in the girls—that their disappearances are punishment from God—or whether the disappearances signal trouble with local Wampanoag relations as either repercussions for prior war or, again, punishment from God. Since the girls and their disappearances raises the question of resurrection or return from the grave, Mr. Mills plays off of the reader’s suspended sense of reality. Throw in a little bit of Mr. Mills’s special element–the ethereal–and one is left with Mr. Mills’s particular take on madness, mind, religion, realism, and rationalism. Mr. Mills’s use of environment—his dark, tangled bank—provides the backdrop for constant doubling of character aposiopeses which are loosely woven together into plot. The non-sequitur nature of the plot threads makes it easy for the reader to quickly pick up on these classic doubles: internal, external; guilt, absolution; environment, “civilization;” New England Puritan, Native American Other. On one hand, the novel reads as an introspective surrealist take on issues easily and commonly brushed over in more traditional New England typology; on the other hand, the novel begins to take on the feel of apologetic Leatherstocking-tales. Undeniably, Mills’s novel is a foray into the strange. Strange as a genre and strange as an interesting embodiment, perhaps, of the space between the tangible and intangible. It is a genre literally bridging between a physical world and a mental one. It plays off the particle physics descriptions for quarks—which are, themselves, elementary particles and a fundamental constituent of matter. Quarks got their name because they were unexplained parts of a larger math equation; these unexplained particles translated into a scientific flavor that, historically, looked to bridge what was physically observed in the natural world and what needed to exist to substantiate mathematical harmony and elegance. The strange, in other words, was just that: strange. It filled the void of the unexplainable. Mr. Mills and strange literature seek to occupy a space that is unexplainable with a plot and characters that exist between the real and the physical world and the world of the supernatural—whether that’s the Puritan God or the ethereal horror and beauty of the characters’ spirits. The literary genre, and certainly Mr. Mills’s novel, takes on these characteristics and champions the literature. 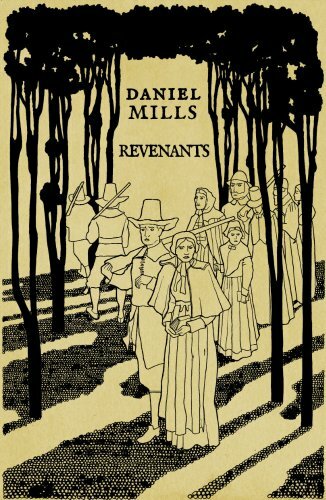 Mr. Mills’s Revenants returns to a body—a corps of literature, if you will—of classic New England literary types, and introduces a wispy, ghostly Otherness and revenire. A revenant in and of itself. Dr. Lydia Pyne specializes in the philosophy and intellectual history of archaeology and paleoanthropology. Her field work and experiences in anthropology range from Arizona and New Mexico, to South Africa, Ethiopia, and Uzbekistan. She is currently an adjunct faculty member at Drexel University’s Pennoni Honors College and Drexel University’s Writing Center. Dr. Pyne is the co-author of an upcoming book on the intellectual history of the Pleistocene.